Ms. Tyler began her legal career as an associate in the tax section of King & Spalding LLP in Washington, D.C. Ms. Tyler’s practice focused on international, corporate, partnership, and non-profit tax planning. When Ms. Tyler got married, she relocated to Norfolk, Virginia, where she joined the Norfolk Commonwealth Attorney’s Office. 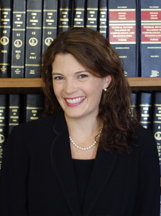 Ms. Tyler later served as the Public Finance Attorney for the Virginia Beach City Attorney’s Office, where she advised city departments regarding taxation, finance, budgeting, procurement, and other legal issues. Ms. Tyler is from Sebastian, Florida, and has been a resident of Hampton Roads since 2003. She is married to Nathaniel Tyler, and has two young children, Price and Elle. Ms. Tyler enjoys spending time with her family, gardening, reading, and practicing yoga.